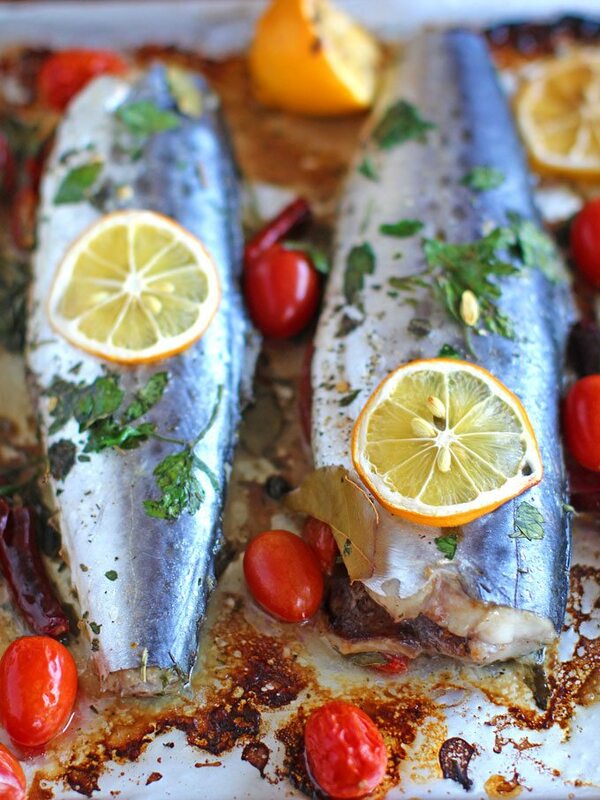 Oven Roasted Spanish Mackerel marinated with grape tomatoes, capers, dried chili peppers and lemon is healthy, and one very tasty and easy meal to make. 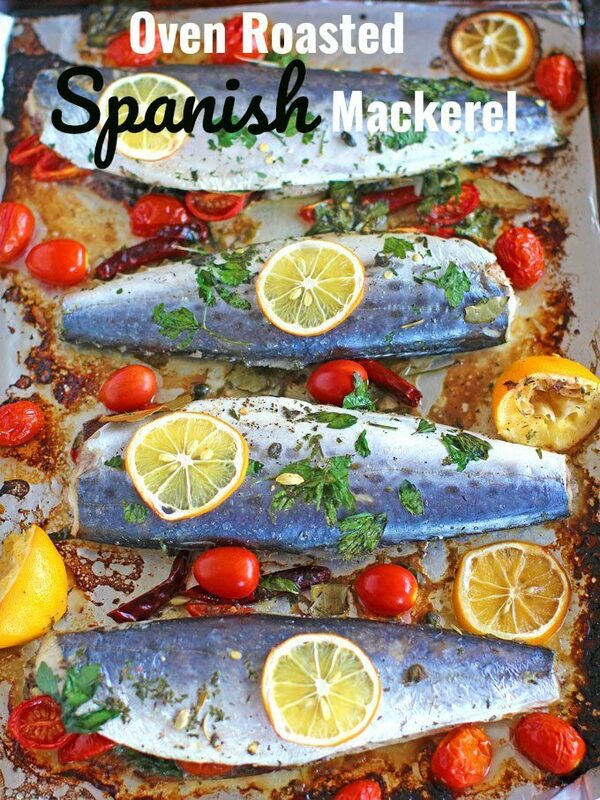 Oven Roasted Spanish Mackerel is the tastiest of the Mackerel family. The Spanish Mackerel is a beautiful fish, with dark grey-blue skin and darker, very juicy meat. The fish also doesn’t cost an arm and a leg, so it’s very budget friendly. 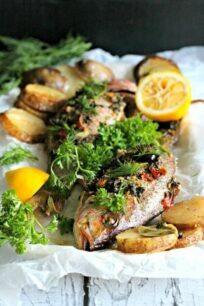 Very easy to cook, the Oven Roasted Spanish Mackerel can be made for a weeknight meal to get your Omega 3 or it can also be served for a special occasion, as the meal looks festive and nice. To make the cooking process even easier, ask for fish to be cleaned. Also, discard the head and tail when buying it. When shopping for fresh mackerel make sure is does not have a strong odor. The eyes should be bright and clear, moist skin and shiny scales, to ensure you are getting the freshest fish. Marinade the fish few hours in advance, it will taste a hundred times better. Using fresh produce is key, fresh lemon juice, grape tomatoes etc, and don’t skip the capers! Do not discard the marinade, you want to use it for roasting the fish. Make sure you don’t over-bake the fish. You want it juicy not dry, once the meat is white and tender it is ready to serve. This is such an easy and healthy dinner that can be marinated ahead of time and roasted 40 minutes before dinner. 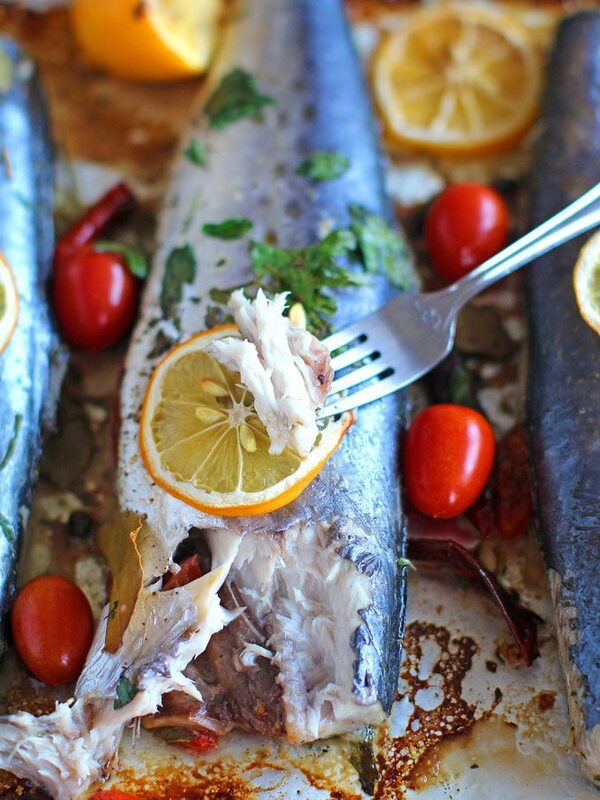 Spanish Mackerel is not a very expensive fish, so it won’t ruin your budget. 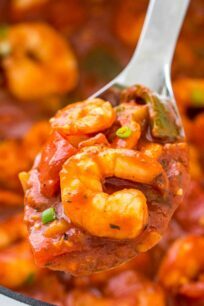 Bursting with flavor this dish can be served on a busy weeknight or special occasion dinner. 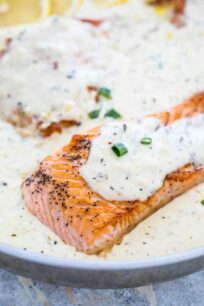 This fish is also one of the richest sources of Omega-3 fatty acids. In addition, it is rich in protein, with a serving size of three ounces containing approximately 21 grams. 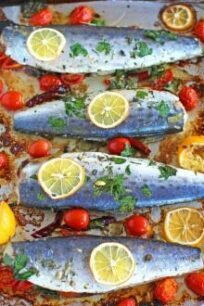 Mackerel is a good source of niacin, choline, folate, vitamin E, vitamin D, vitamin A, vitamin K, vitamin C and vitamin B12. Is it ok to eat the Mackerel’s skin? Yes, you can and actually the Mackerel skin is full of healthy fats! I prefer to keep the skin on the Mackerel when I cook it, as it helps keeping the fish moist while cooking. What wine pairs well with Mackerel? Capers – salty and briny, capers are perfect to add a mix of flavor to your dishes. Sheet Pan – I love these pans, they are 17×12 inches and also have a lifetime warranty. Organic Olive Oil – olive oil can make or break a dish, I always opt for organic, high quality oil to add to my marinades and salads. Dried Chili Peppers – these are great to add some heat to any dish, we always keep some in our pantry. Bay leaves – another pantry staple, we use it in many recipes, especially marinades. Dried Oregano Leaf – it can be skipped in this recipe, but if you like oregano flavor go for it, it will make it so much more flavor and tastier. Using 4 tablespoons of olive oil, rub each fish with olive oil and set aside. Slice ½ cup of grape tomatoes in half. On the inside of each fish, spread evenly 1 tablespoon of minced garlic and sprinkle with salt, pepper a pinch of thyme and oregano. Stuff each fish with a few sliced grape tomatoes, 1 dried chili pepper, 1 teaspoon capers, 2 slices of lemon and 1 bay leaf. Place fish in a deep baking dish, so they sit tightly and close to each for the marinade to soak into them. Cut one fresh lemon in half and squeeze it over the fish. Place the lemon halves into the dish between the fish. Top with fresh cilantro, cover with plastic wrap and refrigerate for 2-4 hours. Preheat oven to 350F and set the oven rack in the middle of the oven. Cover a baking sheet pan with aluminum foil (or baking paper) and lightly grease it with 2 tablespoons of olive oil. Transfer each fish to the prepared baking sheet pan, top with a slice of lemon, add the remaining one cup of grape tomatoes and the remaining 6 dried chili peppers to the pan. Divide evenly between the fish. Drizzle with a little extra olive oil. Pour the marinade over the fish. Place in the preheated oven for 35-40 minutes, or until fish is cooked through and the flesh is white. Serve with rice or roasted veggies. The flavor in this sounds amazing! This looks like it’s fresh out of the sea. It’s a stunning dish that would knock the socks off of anyone at the table!! Beautiful photos! Love all the colors! That first photo is the most beautiful fish picture ever! Looks so good. I have never seen fish look sooo good. I haven’t had mackerel in forever! Stunning presentation!! New to your blog and absolutely lOVE it! Yum! We made it and all the flavors went so well together. What is wt of yr mackerel? Dried Chilies– what kind–ancho , etc? Made it Saturday. It was fantastic! ALthough I use these ingredients in many recipes, they were transformed in this dish to something else entirely. I didn’t have much time for fish to marinate. 1 fish per person is a lot. The fish I got were 1.3lbs each.